Beauty is often synonymous with facial harmony and the chin plays a crucial role in this equation. Although many people do not realize this integral relationship, a small or recessed chin can cause the nose to look larger or the neck to appear looser. The goal of chin augmentation is to create balanced proportions by improving the size and shape of the chin using a specialized surgical implant. Often a chin augmentation (mentoplasty) is performed in conjunction with other procedures like a rhinoplasty (nose job), facelift, or neck liposuction to achieve optimal results. Whether on Hollywood’s A-list or a Fortune’s 500 top CEOs, men with strong chins are more likely to be successful. According to Business Week, a strong or weak chin can influence judgment on the strength of your character, attractiveness, leadership capabilities and confidence. If you are unhappy about the size, shape, or definition of your chin, you may benefit from having a chin implant. Furthermore, if your chin is recessed leading to an overly large nose or poorly delineated neck, a chin augmentation could help balance your profile. 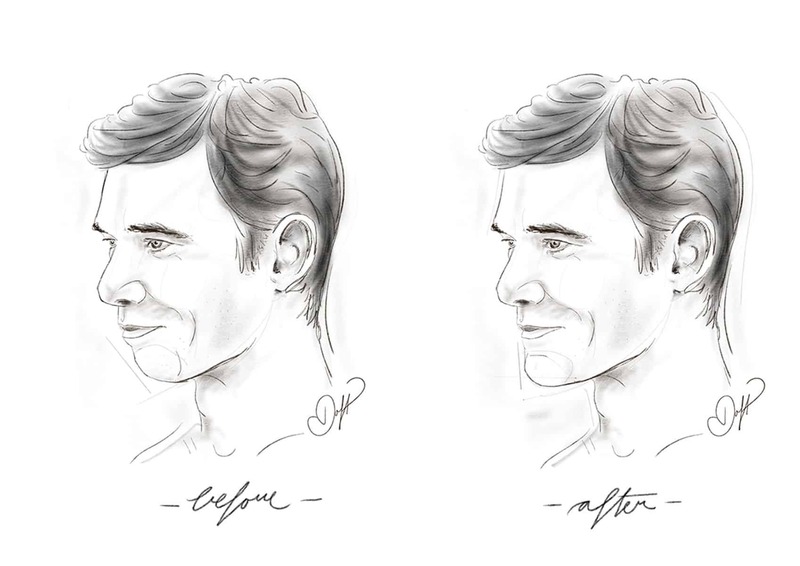 By correcting a recessed jaw, people will longer be drawn to your chin but will instead focus on your strong features. The implants used for chin augmentation are made from a biocompatible, flexible silicone. Unlike breast implants, the silicone is solid. A silicone chin implant cannot leak and does not need to be replaced. The chin implants are available in several sizes depending on the dimensions of your face. They are even available in the shapes of a cleft chin or a square-jaw. I often sculpt the implant to better fit your anatomy. The implant is created with wings to not only provide volume to your chin but also to define your jawline. The goal of a chin augmentation is to create balanced proportions by improving the size and shape of the chin using a specialized silicone implant. As one of the least invasive cosmetic procedures, a chin augmentation can provide an immediate and impressive difference, balancing facial structures and creating a harmonious profile. Under anesthesia, a small incision is made in the crease under your chin. Many people have fallen on this area as a child and already have a scar. If that is the case, I try to use the same scar that you have from childhood. The implant is inserted to lie directly on your bone. The wings of the implant extend along your jawline to anchor the implant in place. Sutures further secured the implant. By placing the implant deep into your chin, you will not appreciate its edges. Due to the implant’s flexible material, it can be inserted through a very small, inconspicuous incision, creating a minimal scar. Generally, in an outpatient setting, a chin augmentation is performed using local anesthesia with sedation. The procedure takes about thirty minutes to perform, with patients usually able to return to work and other regular activities in a few days. The tape is removed in two days and sutures in five. Although you will see an immediate improvement, the swelling will recess over the next few weeks. You can begin light exercise on day one but it is best not to overexert yourself as it will lead to increased swelling. You can resume strenuous activity in three weeks. If you are unhappy with your new profile, the chin implant can be removed. This can be performed under local anesthesia in the office. Once removed, your chin will revert to its original appearance. Some patients are nervous to undergo surgery or to have a permanent change to their profile. For these patients, I often inject dermal fillers into the chin area. Dermal fillers are made of hyaluronic acid, which is found naturally in your body. The newest generation of fillers is cross-linked to be stiffer, enabling them to truly enhance your chin. Once injected, the fillers slowly dissolve over the course of a year. Although not a long-term solution, the addition of dermal fillers is often a great idea for someone who is not ready to commit to an implant. Due to the nature of the material used to create a chin implant, it does not need to be changed during your lifetime. Occasionally, the implant can become infected. If this occurs, it will need to be removed to allow for the infection to resolve. Afterwards, you may plan to have a new implant inserted. If you are considering a chin augmentation, please call our office at (212) 600.4109 to arrange for a consultation. Our New York City practice accommodates out of town and international patients who need to travel in for surgery as well as those who are local to Manhattan.